The Girls' Reversible Down Sweater Hoody from Patagonia delivers superior warmth in a lightweight, water-resistant and colourful shell. 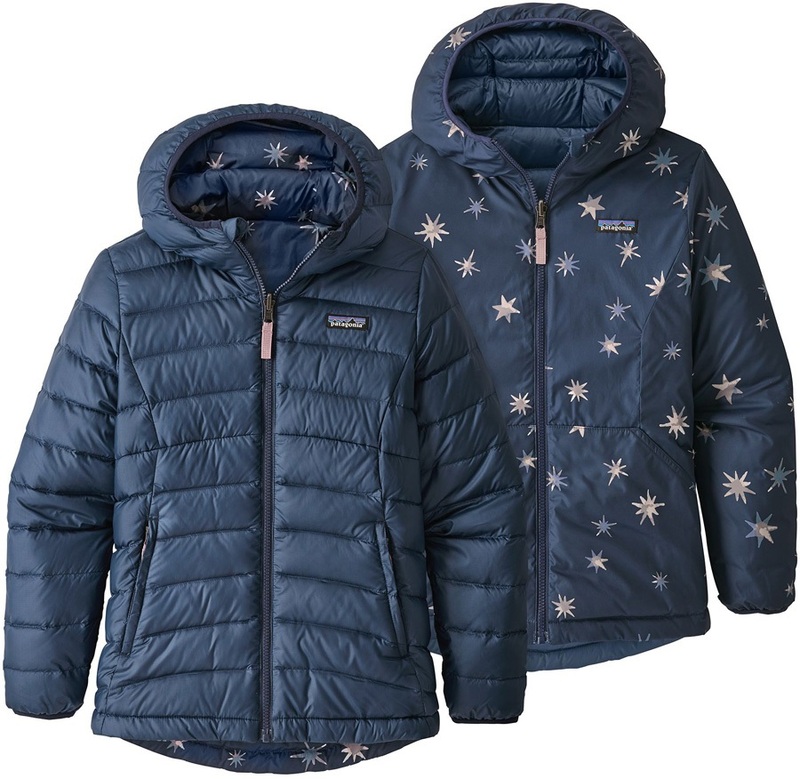 The 600-fill power European goose down is enclosed in a 1.6-oz 30-denier polyester mini-ripstop shell. This windproof, breathable fabric is treated with a DWR (durable water repellent) finish to make it resistant to light rain and snow. The quilted-through down lining is super light, exceptionally warm and will stay put even through constant use and relentless washings. Staying true to Patagonia's dedication to making environmentally and naturally conscientious products, the down is 100% having been reclaimed cushions, bedding and other used items that can’t be resold. It is hypoallergenic and offers the identical performance benefits to virgin down. This fun little jacket is fully reversible, so little obnes can choose between classic solid colour on one side, or a pretty printed pattern on the other. An adjustable drawcord at the hem and elastane bindings on cuffs seal out drafts and keep heat in. The quilted three-panel hood will protect the wearer from the elements and also features elasticated binding for a snug fit. Ideal for all kinds of cold weather outdoor play, the Hi-Loft Down Sweater Hoody offers lightweight, comfortable warmth for all young adventurers. Lining:2.2-oz 100% polyester plain weave.